A college graduate’s 11-month walking tour of America. Following graduation from Middlebury College, 23-year-old Forsthoefel hatched a plan to leave his mother’s home in suburban Philadelphia and walk until he spent all his money or hit the Pacific Ocean, whichever came first. Guided by his literary heroes Rainer Maria Rilke, Khalil Gibran, and Walt Whitman (whose democratic spirit is a major influence here), Forsthoefel began traveling west with the bare minimum for shelter, a sign reading “Walking to Listen,” and the vague idea that his trip would be “like a graduate program in the human experience.” For the author, the impetus to walk was indefinable but urgent: “I woke up the next morning anxious to get walking again, toward what, I didn’t quite know.” Along the way, Forsthoefel confronted the “others” of society, and he remarks on race, class, and privilege. He also explains that while a student at Middlebury, he researched the concept of “coming of age” and how other cultures prepare their young to become adults. It’s not hard to see how this concept informs Forsthoefel’s trek, which was his own attempt to define his adulthood in the post-collegiate existentialist void experienced by so many millennials. However, the author’s sincerity and earnestness are tempered by his urge to “learn something” from his encounters. He refers to the people he met as his “teachers,” and he was consciously aware of his use of their experiences for his gain. (This also cost Forsthoefel his job on a fishing boat prior to his cross-country journey, when he revealed to the captain that he’d begun a blog about the experience.) The author recorded his conversations for future logging and transcribing, all a sign of his intention to use his trip for some other end, not merely the empathic experience of meeting citizens. 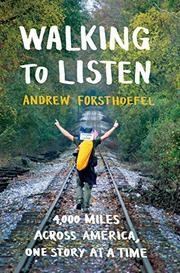 However, Forsthoefel offers moments of genuine kinship and transcendence that buoy the narrative and make the adventure an uplifting, somewhat labored exercise in outreach. Millennial ennui turns into a search for meaning in an intriguing portrait of America.